The Vocational Rehabilitation Program is one of many offered by the Prairie Band Potawatomi Nation Social Service Department. From Left: Program Manager Sarah Cowan, Support Staff Nevika Kitchkommie, and Counselors, Samantha Wahwassuck and Julia Griffith. Entering its twentieth year of providing service, the PBPN Vocational Rehabilitation program prepares Native Americans with disabilities with resources to rehabilitate, gain or keep employment. Not every disability looks the same, in addition to physical limitations some mental health issues and substance abuse issues are considered a disability if the individual has a diagnosis. No two employment plans are identical, some individuals are trying to get back into the workforce while others may be employed and newly diagnosed with a condition and need assistance adjusting. Each client of the program receives highly individualized services tailored to meet their specific needs with the prime goal of providing resources to the client so they will be more employable. The program does have stringent eligibility requirements, which means not everyone is eligible. Two starting criteria include living in the service area (Jackson, Brown, Atchison, Jefferson, Shawnee, Pottawatomie, Nemaha or Doniphan county) along with being an enrolled member of a federally recognized tribe, not just PBPN. After meeting those two criteria the next step is contacting the Vocational Rehabilitation staff and completing the application process. The application process is a critical step and it can take a fair amount of time to complete. It includes an intake appointment where information about the applicant’s disability and employment history is gathered to verify how the applicant’s disability impacts their ability to gain employment. PBPN VR can provide a referral for individuals to obtain necessary assessments to determine eligibility in the program. Under federal regulation, the program has 60 days from receipt of the application to make an eligibility determination. Once eligible, the client and staff have 90 days to develop an individualized plan of employment. PBPN Vocational Rehabilitation can offer a wide range of individualized employment services to eligible participants. For instance, the program has provided assistive technology like hearing aids and other similar aides for physical limitations. Or if a client was receiving CNA training the program could purchase scrubs. For those dealing with substance use, services would include incorporating the recommendations of the health care provider to encourage rehabilitation. The tribe’s program also allows for non-medical interventions and cultural services, like holding a ceremony. Clients can also work with the state’s program or other resources at the same time but PBPN “Voc Rehab,” as it is commonly referenced, cannot duplicate services. Once a client becomes employed, their file stays open for an additional 90 days to ensure the client has a successful transition. “We work with a lot of people who are in very vulnerable times in their lives, and it can be hard for clients because they are in crisis mode 24/7, we help them work through it and reach employment as they regain self-sufficiency,” stated Sarah Cowan, PBPN Vocational Rehabilitation Manager. 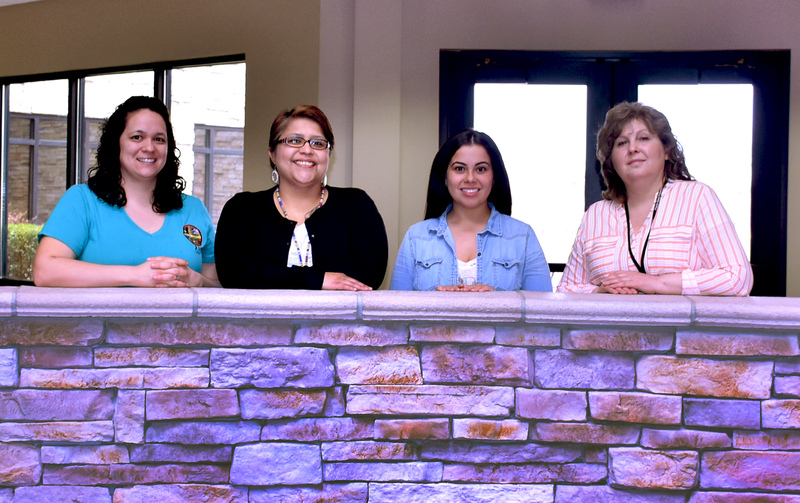 The Prairie Band Potawatomi Nation Vocational Rehabilitation program is one of many services available to the community under the umbrella of the PBPN Social Services Department. The program is staffed by program manager, Sarah Cowan, counselors Julia Griffith and Samantha Wahwassuck, and support staff member Nevika Kitchkommie. The program is funded by federal competitive grant dollars administered by the Department of Education (DOE), along with a tribal match. There are 88 grant programs in operation around the United States. In 2018, the PBPN Vocational Rehabilitation program worked with 125 individuals. Along with their direct work with clients, the program also offers a free weekly jobs class available to the public. Class is held each Tuesday, from 12 p.m. to 2 p.m. in the Social Services department. The department is located in the east wing of the Prairie Band Health Center located on 158 Road. To reach the Vocational Rehabilitation staff contact 785-966-8330 and select option 7, or visit www.pbpindiantribe.com/social-services/vocational-rehabilitation/ for more information.